When Gary Numan worked his way into the collective public consciousness in 1979 with his worldwide smash single “Cars,” he presented an icy, detached, robotic and ever dour persona. The real Gary Numan is nothing at all like that image: he’s funny, animated and disarmingly candid (“I’ve got Asperger’s,” he admits. “I’m brutally honest because I don’t know any other way”). Though “Cars” (from his third album, The Pleasure Principle) would represent his commercial peak, Numan would go on to record and release a highly regarded string of albums. His music touches upon many styles: industrial, electronica, metal, goth, new wave and more. After years spent below the radar of mass pop culture, Numan has roared back with arguably the best work of his career. 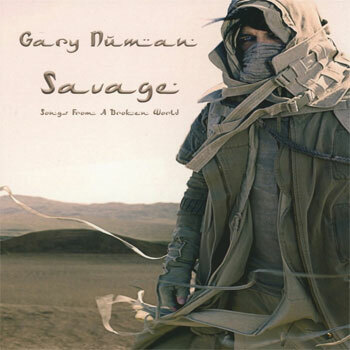 The songs on Savage: Songs from a Broken World are set against the bleak backdrop of a dystopian, apocalyptic world. Released in September, Savage soared to the #2 spot on the UK album charts, and fared moderately well on the U.S. charts. On the eve of the north American leg of his current worldwide tour, Numan sat down for a conversation, discussing global issues, his creative process, Savage, and why he still plays “Cars.” He also explained why – despite having recently expressed interest in doing so – he’s not getting into soundtrack work after all. Savage has a thematic undercurrent, specifically the aftermath of ecological disaster. Which came first, that concept or the individual songs? Well, the whole thing sort of evolved in bits and pieces, really. I was working on a novel for several years now; it’s embarrassing, actually, how long it’s been taking me to work on it. When I started to make the album, I started to lift ideas from the novel, but in truth, the novel is only a collection of fairly chaotic ideas. So the whole global warming aspect of it is something that was sort of developing in the middle part of 2015, really. I had the idea for this future world: it’d be like a desert, and the reason for that being a global warming apocalypse. And that wasn’t at the beginning of the novel; it was more towards the end of it. So then that started to become an important part of the story with the book. All that coincided with Donald Trump appearing on the political scene, talking about global warming being a hoax and that kind of thing. That suddenly made that idea within my story a lot more important and a lot more relevant. Do you think that the album is ultimately better because of Trump appearing on the global landscape, or do you think Savage would’ve been the album it was even if he hadn’t come on the scene? Well, I’m not sure the album would’ve been entirely devoted to the global warming idea without him. So, in that sense, I think his arrival on the scene did make a difference. My original idea to borrow ideas from the book was really just to get me going, because I didn’t really have anything in mind that I wanted to write about specifically. But having done that and having got those first two or three songs sort of ticking along, and then him appearing, and then me realizing the connection between those two things … it did make a difference, actually, and it became a lot more important. Before that, it was just a science/fantasy story that I’d been stealing ideas from. It suddenly became a lot more important to me, and it had a relevancy, at least the way I saw things. When the Paris Accords were signed, it seemed to me as if the world had come together. The global warming problem was being taken very seriously, and the world was doing something about it. It was very much at the beginning of doing something about it, but nonetheless, something was being done. In my mind, global warming and the whole climate problem had become yesterday’s news. You know, it was a problem that was being dealt with, and now we could move onto other things. It felt as if we’d taken two or three steps back from the abyss. But with Trump, it seemed as if we were suddenly right on the cliff-edge again, you know, looking into this big, big problem, and so it suddenly all changed for me with Trump. It was important to write about it. I don’t mean “important” in that anyone’s gonna take any notice of what I’m saying, but for me, it became something I really wanted to write about. That, as opposed to just something before that was simply to get me going, to get the creative juices flowing. It became much more than that very, very quickly. Historically, in times of pessimism, many artists and audiences sort of make a decision to head in an escapist direction, to get away from the ongoing barrage of unsettling images and events. Clearly with Savage, you’ve gone in the opposite direction. Is that just something in your nature? It’s not in my nature, actually. If I’m honest, I’m one of those people that sees music as an escape from everyday problems. And I’ve not been political at all, musically. So, with Savage, it is quite a departure for me to sort of try to get involved in some small way, and all I’m trying to do with Savage – and I really don’t see it as any huge statement or anything important at all – is making an album of songs for people to listen to and enjoy. Focusing on climate change is just my small part in making people continue to talk about it, continue to see it as a problem. It’s worrying. You know, I read only about 20 minutes ago that Syria has now joined the Paris Accords. So, when Trump brought America out of it, America will be the only country in the entire planet that’s not signed up. You know, that’s shocking, absolutely shocking. It’s a talking point and I think it needs to remain a talking point until wiser heads take charge in America again.